The Medicare and Medicaid EHR incentive program is another reason to consider installing this type of software — it can give your practice the opportunity to receive incentive payments for EHR implementation. Do I need an EHR or an EMR? The differences between an EHR and an EMR — electronic medical record software — may seem subtle, so we’ve laid them out for you to help you make the right choice. Basically, EMR software allows users to store and record medical information and patient care data like test results, allergies and prescriptions. EMRs can issue repeat prescriptions, schedule patients and send bills. But data within an EMR doesn’t easily travel outside the practice for collaboration with other organizations or even other practices. EHRs do the same thing as EMRs, with more robust communication features. In addition to tracking and managing patient care, practitioners from various organizations can use EHRs to collaborate to provide the best support network possible. Choosing between an EHR and an EMR can seem like an obvious choice, but don’t make the leap just yet. While an EHR is usually the best choice for large practices and hospitals that need to share information with other healthcare providers, the same may not be true for small practices. If your practice is self-contained or specialized, an EMR could be more than enough to fulfill your needs. We’ve compiled a checklist for both EHR software features and EMR requirements to help you make the right choice for you. Do you require certified EHR technology? What kind of inefficiencies does the current system you are using have? How will getting an EHR system help your organization? Does the system at the top of your list introduce new limitations or will it solve the problems you currently have? Will the new system have the features you truly need? How well will the data you have in your existing system transfer to the new system? Who will implement the new system? Who will provide or be given training for the new system? Will upgrades and customer service be included as part of the purchase? How will the new system interface with the other systems in place? Can the EMR be easily integrated with the other services you use (billing systems, public health interfaces, etc.)? Does it meet EMR integration standards? Where will the data be stored? Organization offices, a secure data center, etc.? If at a secure data center, what kind of security is available? Can the vendor make sure the data will be accessible constantly? What happens in the event that security is breached or there’s a total system failure? Is there a warranty? If so, what does it cover and for how long? 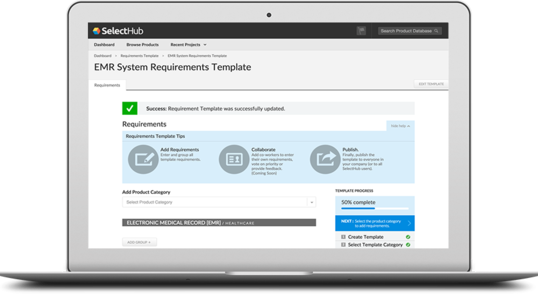 What are the most common EHR system requirements? EHR systems can be broken down into a variety of categories in order to ensure you’re getting the features you need. Not every EHR platform will have every single one of these features, so it’s important to know exactly what your practice needs. These are things that make it easier for a physician to do their job with the patients. EPrescribing allows physicians to submit an RX directly to the pharmacy of their choice so patients can pick up their medications in a time and place that suits their needs. Within an EHR with electronic medication administration record (eMAR) functionality, practices can track medication in order to keep it from being abused and to ensure it is properly received. Similarly, computerized physician order entry (CPOE) lets practices submit medication orders directly through the EHR system, negating the need for clunky additional communication channels. What makes an EHR an EHR is its ability to communicate with a variety of sources outside the practice. This section of electronic health records requirements is crucial to make sure you’re getting the full functionality of EHR features. Patient portals are more than just helpful — they are expected in this day and age. Patient-centric portals give patients the ability to access their medication records, lab results, appointment schedules and educational resources. This can be done via an in-system portal or through software integration with a third party like Google Health. Appointment scheduling EHR functionality is another critical aspect of running a medical practice that EHRs can help with. Your EHR should allow users to create and maintain patient appointment schedules so everyone is on the same track. Some EHRs allow patients to make their own appointments in the system or send automated reminders to patients with upcoming appointments. This feature saves front desk staff time by automating repetitive or menial tasks. SDM, or secure direct messaging, is a miracle of the modern world. Instead of wasting patient and physician time on ailments that are very minor or on commuting to the physical office, patients can simply message their physician via their EHR’s secure direct messaging system. Physicians can advise patients on medication changes and minor health problems or let them know an issue is serious enough to warrant an in-person visit. One of the more underappreciated EHR software features is an EHR that ensures E/M coding accuracy. Insurance reimbursement coding must be managed accurately in order for your practice to receive money for filed claims, and an EHR can facilitate proper paperwork submission to save you even more time and money. Before a patient can be accepted for treatment, your practice has to make sure it knows whether the patient has insurance. Through clearing-house technology, many EHRs offer instantaneous insurance verification, so you always know you’re covered. An EHR’s specialty is communicating with other services — right? Well, some do this better than others. Communication extends beyond being able to import or export patient information. One important feature is the ability to request, process and then store lab orders and results. Can your EHR submit lap orders to labs outside of your practice? What about receive results from those labs? Once you’ve submitted and received them, can they be displayed within a patient’s electronic health record in a way that’s easy to understand? These are all important things to keep in mind when purchasing an EHR. Immunization registries are a federal database that collects vaccination records on citizens with the goal of maintaining high vaccination coverage. They consolidate medical data on children from multiple healthcare providers in order to identify children who are due or late for vaccines. If an EHR system can’t be connected to these databases, patient data can’t be accessed later for important CDC studies or tasks like college enrollment. Another aspect to keep in mind is whether the EHR can integrate with other software. If you operate a large multi-location practice or hospital, can this EHR integrate with a practice management software? What about medical billing software? Finding out what interoperability capabilities you need beforehand can help ensure practice-wide implementation. You should also look for technical architectural features. These can include a range of EHR features and will definitely vary vendor-to-vendor. One you should consider regardless of size and specialty is reporting capabilities. Because every patient is different, custom reporting features are very useful to have in an EHR. Users can create customized reports to visualize chart data and other important information and make it more digestible. An EHR should also offer users the ability to upload and store documents directly within a patient’s electronic health record. This can be as basic as picture storage to lab results and readouts. Medical compliance and data security is another element to keep in mind when purchasing an EHR. Almost all will be HIPAA compliant and come with ICD-10 support, but there are plenty of other types of security and certifications to look out for in order to get the best system for your practice. Some will be ONC-ATB compliant, meaning they have been certified by an additional regulatory body. Some will also be CCHIT certified. How your system is accessed is another thing to consider. The EHR system can be installed into your private systems (called on-premise) or via software-as-a-service (SaaS) cloud-based EHR. Some deployments will give users access to mobile web apps that can be accessed remotely. Using this EHR selection criteria template can help your evaluation of which EHR system to use. If there is not a category mentioned that you think is important, don’t be afraid to evaluate a system based on that as well. Picking the best system for you is crucial to success. Looking for an EMR/EHR system and want to evaluate its features against your most important requirements? Use this free EMR/EHR functional requirements document to make a best-fit decision. What are the most common EMR Software Requirements? Like the software mentioned above, software for electronic medical records have their own key points that should not be disregarded. If the requirements for EHR didn’t feel like the right fit for you, this checklist of EMR features may be helpful. There are two types of key EMR system requirements: physician worklist requirements and charting capabilities within the software itself. When dealing with electronic medical records, the physician should be able to access everything with ease. As the name suggests, an EMR should keep track of patients’ electronic medical records. With intuitive dashboards for visualizing data, EMRs make it easy and efficient for physicians to familiarize themselves with patient data prior to appointments, streamlining patient care. The charting capabilities found in each system also contribute to how easily a physician can access patient records. Subjective, objective, assessment and plan (SOAP) note functionality is a huge benefit to practices as they communicate with interdisciplinary teams to treat patients. 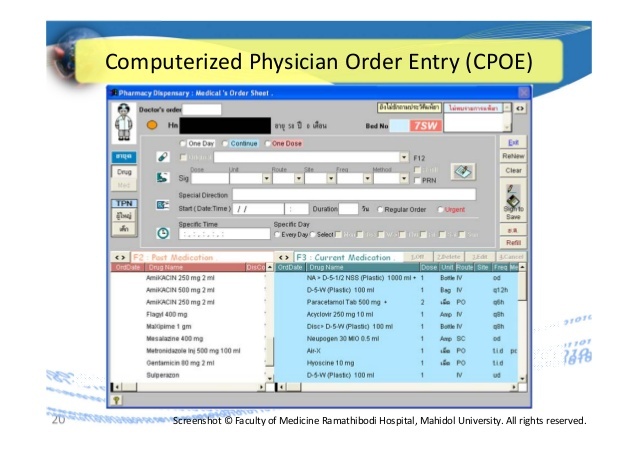 Along the same lines, computerized provider order entry (CPOE) can streamline practice workflows and balance workloads. Both these capabilities foster communication, accuracy and value-based care. Systems are often evaluated based largely on the above electronic medical records requirements and classifications of features of EMR. However, there are functional requirements to keep in mind as well. These EMR software features will help streamline workflows within your practice, between your practice and pharmacies, and between patient and care teams. Prescriptions have come a long way since they were scribbled onto an Rx in a physician’s illegible handwriting. Eprescription functionality allows practitioners to submit prescriptions directly to both in-practice pharmacies and external ones. In the same vein, EMRs should save prescription and prescribing information so patients can easily select and auto-renew their prescriptions online, saving everyone time and money. On the subject of saving time, good EMR functionality will offer schedule management. Both patients and front desk staff can utilize this feature to schedule, view and receive automated reminders of appointments. EMRs will even include integration with a medical billing module. This allows users to generate invoices, track payments, advance payments and communicate with their medical billing software or service. This includes insurance verification capabilities. Your EMR should offer built-in medical clearinghouse technology that enables real-time insurance eligibility verification. This ensures patient eligibility before treatment. Lab work is a crucial part of patient care, so it should also be an integral element of EMRs. Your electronic medical record software should integrate laboratory information, patient records and billing information to coordinate between care delivery and laboratory operations. Most systems will facilitate instant sharing of this information with patients via an online portal. There are some technical requirements that should be looked at when considering purchasing an EMR. They should follow all law and regulation requirements under HIPAA, as well as other industry-specific security standards. Compliance to these will keep illegal activity to a minimum – especially if the technology decides to malfunction and you can’t catch it in time. In addition, you should look at how the system deploys. Will they offer host installation – i.e. the system is installed off-site – or will it be installed directly into the system – on-premise installation? This choice has effects on cost, security, support and access, so make sure you’re educated before you choose. How to Find The Right EHR/EMR Software? With so many vendors out there that sell this kind of system, evaluating EMR or EHR selection criteria can seem like a daunting task. However, it is best to keep in mind that there are plenty of ways to help narrow down the list. When selecting a vendor, the first thing you should do is research. Look specifically at the reviews and surveys. This allows you to immediately eliminate any with poor reviews overall or those that seem like a poor match for your needs. For instance, a mismatch in priorities can happen if a vendor works primarily with companies that are a different size than yours. This will allow you to receive the best service for what you pay. EHR systems are solutions that allow you to streamline the process of keeping health records and medical records up to date. Did you find these guidelines and the EMR & EHR checklist helpful? What do you look for in an EHR/EMR? Let us know in the comments!